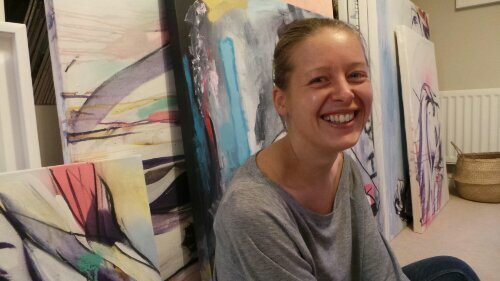 Preparing for a first solo show means sacrifices and for Crawley’s exciting artistic talent Hannah Adamaszek that means space. 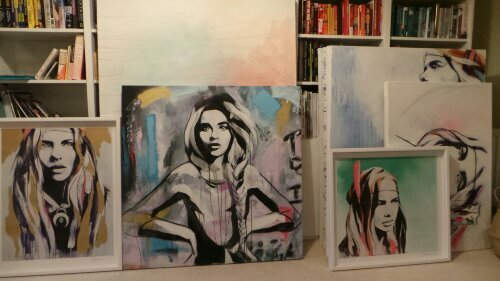 Canvases now take priority in her flat, the spare room becomes a studio and the rest of the her flat becomes a storage space for paintings which will shortly be available for public consumption at the renowned Curious Duke Gallery on Whitecross Street in London. The show runs from 5th-21st September and represents a key milestone for the artist who has only recently decided to treat her art as a full time vocation. Already working with the gallery for over a year when the offer came to produce the show in December Hannah didn’t need too much time to think about it “I was like, yeah! I really really want to do that I was so excited”. 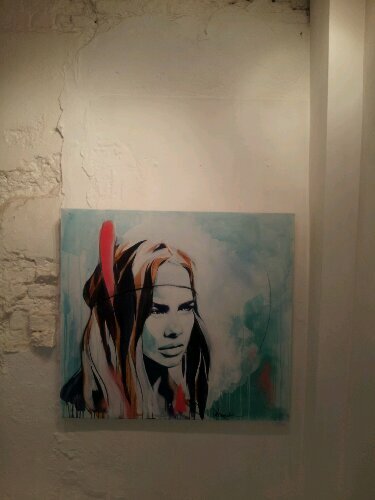 Hannah’s style has been described as ‘Native American’. She often paints women in a natural setting, using a range of techniques which really contribute to giving the image an outdoor and contemplative feel. 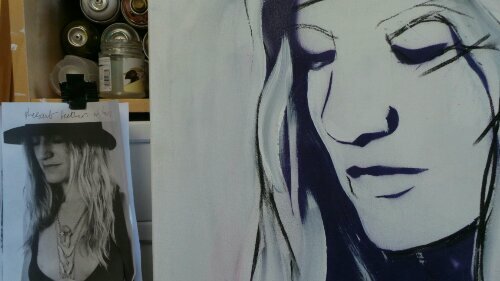 She is inspired by the environment around her and injects that into the process of painting. “The environment is really important because otherwise the painting doesn’t come out how I want it to” explains Hannah. For her it’s a case of being in the right place and the right frame of mind. A self confessed Pinterest addict Hannah seeks inspiration from all around her, not least the colours, forms, sounds, patterns and pictures she finds on the internet. “I look for different inspirations for different places at different times of the day, different moods, different colours and different things that go together”. The same theory even extends to the people she uses in her paintings, often contemplative and reflective in nature she paints women in outdoor settings with the painting reflecting her mood at the time. Music is also an influence with a number of her works including ‘Forest Footsteps’ and ‘Drifting’ having been inspired by works from Kyson and Jimi Hendrix respectively. 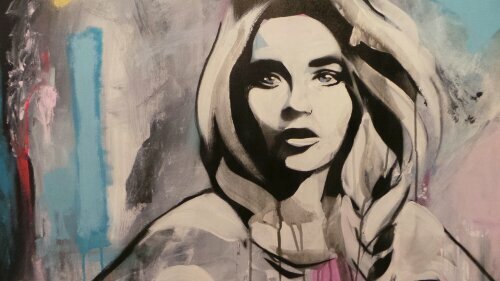 Hers is a complex style, a mixture of stencil, spray paint, traditional paint and charcoal will often go into the creation of a finished piece. 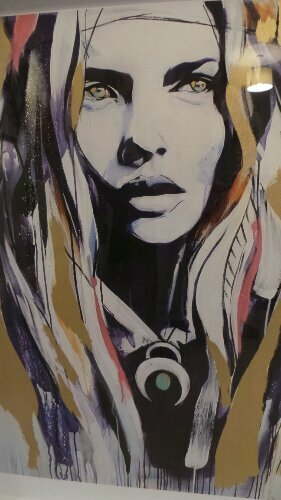 The stencil is often the starting point and usually only on the face. She doesn’t lay the stencil down too strong preferring when the paint is able to work it’s way underneath giving it a softer edge. Layers then build up on top using a range of techniques including the use of spray cans, paint brushes and charcoal to give definition to the image. 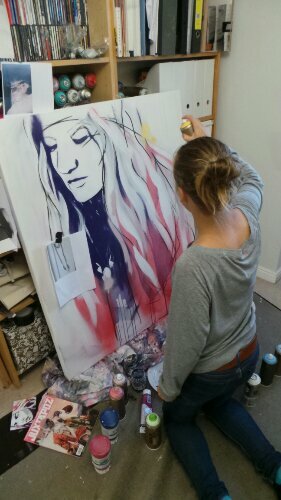 This year has seen Hannah branch out further from the studio and more traditional gallery style into live painting on the street alongside other artists and with the public watching. “I really wanted to try live painting, i wanted to get myself out there and not be scared to paint in front of people so I thought I’d give it a go” says Hannah. 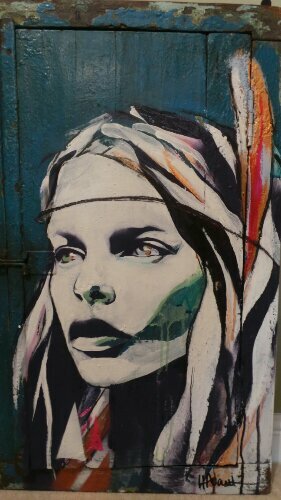 So far this year she’s contributed works to Londons Streetfest and Whitecross Street Party festivals and Bristols massive Upfest extravaganza. “I like painting outside because you can go much much bigger and you don’t have to worry about any mess!” she explains. 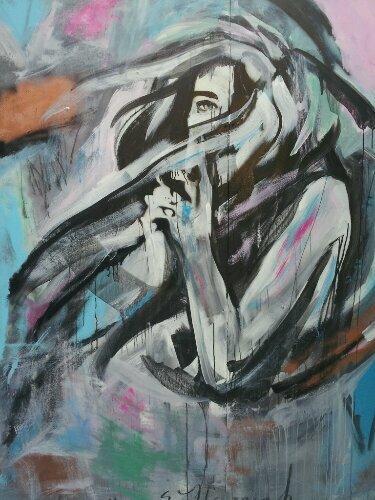 “I’m also a lot more experimental on the street because I can try newer things and different techniques to see how it works” At Streetfest she incorporated a wolf into her painting and at Whitecross collaborated with abstract artist Kristen Gaudio Emsley on a large piece featuring a windswept woman with hair billowing and a dynamic background of colour. “It’s also really nice having people come along and ask what you’re doing. I’ve met some really nice people painting on the street” says Hannah. But for now all focus is going into the solo show. The Curious Duke Gallery has a good reputation for featuring up and coming talent, it has a friendly atmosphere and a good intimate feel without being too small. 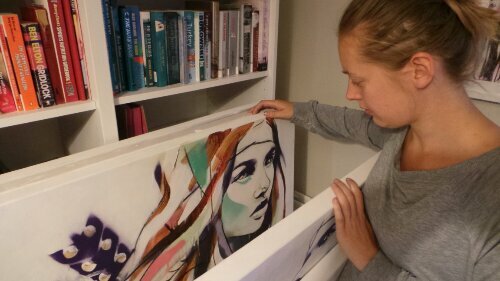 “There’s a lot of preparation and I might have underestimated the size of the space and how many paintings I need to do but they’ve been really supportive of me” confesses Hannah. And that’s not all, getting the gallery ready for the exhibit involves changing the lighting and perhaps even painting a few walls. The infrastructure of the Gallery will change in order to support the work and present the art in the best possible way. The Curious Duke certainly doesn’t do things by halves and the first exhibition from Hannah Adamaszek promises to be a real treat. Whitecross Street Party – Rise of the Non-Conformists.